Crews on Friday worked at clearing damage from Hurricane Lane near Hilo, Hawaii. 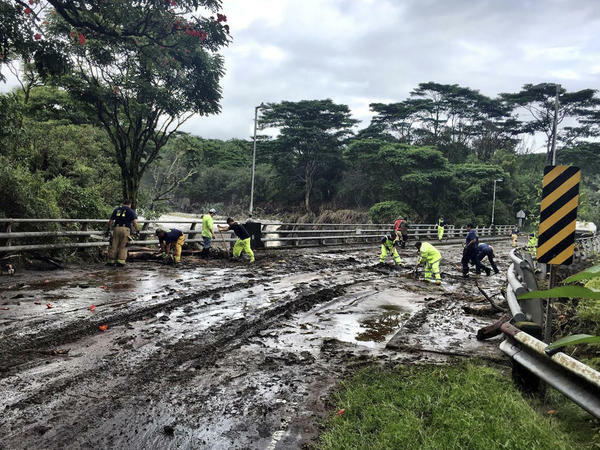 The hurricane dumped torrential rains which inundated the Big Island's main city. On Saturday, the National Weather Service warned of "life threatening" flash flooding and landslides, with the slow-moving powerful storm bearing down south of Honolulu. One estimate predicts that structural damage from Lane could cost the state more than $1 billion in repairs. The brunt of the storm may be past Hawaii, but residents have not seen the end of intense rainfall. "Although Lane is weakening, it is still expected to produce total rainfall of 10 to 20 inches in some areas," Weather Service officials said. Honolulu Mayor Kirk Caldwell said the good news for residents is that the storm has lost strength. "We dodged a bullet," Caldwell said at a press conference on Friday. Still, he cautioned, it "doesn't mean it's over." Caldwell told residents to be a high alert as the near-stationary Lane with winds whipping up to 70 mph lingers and can still cause significant damage and disruptions, including power outages. Officials also expressed concern about the spread of brush fires, which they said have already scorched more than 2,000 acres and destroyed several homes. Some residents hunkered down in a shelter on Maui were forced to flee after a fire broke out. Social media videos depicted parked cars filling up with flames after a nearby brush fire reached a residential area. Josh Galinato told the Associated Press he was trying to sleep when the smell of smoke jolted him awake in the tourist town of Lahaina. "I opened up my front door, and I just saw the fire spreading and coming downhill," Galinato told the AP, saying he and neighbors honked horns to try to warn others of the flames. "The President reiterated that the federal government is fully committed to helping the state in the response and recovery efforts related to Hurricane Lane," a statement from the White House said. Federal Emergency Management officials said about 2,000 people remain in shelters, mostly in Oahu, and Caldwell told residents the shelters will stay open until midday Saturday.